It’s the social media platform that has been on your radar for a long time that you’ve wanted to tie into your recruitment strategy. But you haven’t quite realized how to do so in a way that makes sense for your company. I am talking about Snapchat. The app that a staggering 150 million people use every day and has fundamentally changed the way younger generations interact with the world around them…and that’s not an overstatement. There are a number fantastic opportunities for you to tie Snapchat into your social media recruitment strategy and I’m going to share with you 3 ways on how to do so. Want to drive candidates to application and career pages even when they are not actively looking online? Snapchat offers an awesome way to do that with Snapcodes. These are essentially QR codes that are exclusively used in the Snapchat app. And are the perfect way to bring printed material that you create to life. When you take a snap of a Snapcode it will drive you the website page that it is associated with. So for recruiters you can drive candidates to application pages or pages where they can learn more about you. It’s a great opportunity to use on things like flyers, handouts, recruiting business cards that you would give out at meetups, events. You are giving them an instant ability to engage with an opportunity and build some intrigue opposed to relying on them typing out a URL and navigating their way through the site. Tap the gear in the upper right corner. Select Snapcodes from the dropdown menu. Type the URL you want to drive people to – either the career page or the application for the job. 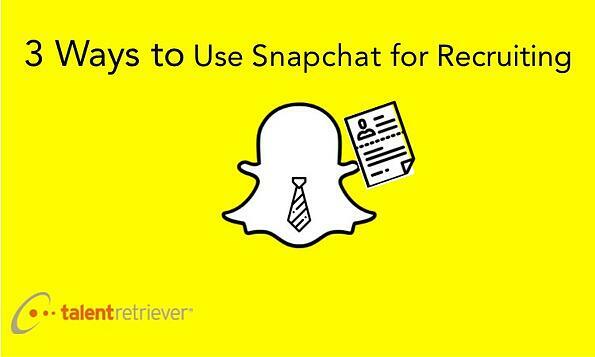 Tap the ghost icon to add an image, like your brand logo to your snapcode. Then add it to your camera roll or email that package to yourself. It’s also a good idea to drive them to a page that has creativity put into it, not just a wall of text job description. So think about that before moving forward. A Geofilter is custom made filter used in snaps that you create and is available to everyone in a certain location during a particular time period of your choosing. It is the perfect tie in for events that you may be hosting, sponsoring or attending. It gives you the chance to create a buzz, generate foot traffic to your booth, and overall promote your brand while spreading the message that you are hiring. And it is within a pretty affordable price range as well. For best use: create one on a desktop by visiting https://www.snapchat.com/geofilters opposed to the app because it makes it a little easier to upload your own design. You’ll then draw a geofence around your location. This fence must be a minimum of 20,000 square feet. At this time you’ll get a pricing estimate based on the size of your fence and the date range you’ve selected. On the final screen, you can confirm your order details including payment information. Expect to pay somewhere around $10-15 per hour per city block on which the geofilter is active. We’ve used Geofilters at career fairs at large universities and have had thousands of student views and filter uses. Another way to use Geofilters - purchase one for the day in the proximity of your office location and have your employees snap like crazy like all day. They will generate buzz and potentially get on the radar of people in their network and build referrals. Have them snap things like them approaching the office from the train if its nearby, team meetings, videos of the workspace, happy hour after work. Make it an all-day effort. Or how about this cheeky idea that Snapchat themselves used. Using Gofilters they targeted the locations of companies like Uber, Pinterest and Airbnb used slogans in the filters like “Not sleeping well?” or “Feeling Pinned Down?” to try to resonate with employees of those companies to make a move. Obviously you don’t want to rustle and feathers with anyone, but that could be a starting point for you to think about how make something a little playful and unique. Alright the debate is real between Snapchat stories vs. Instagram stories. And a great case can be made for Instagram being more optimized for businesses in this respect. With Instagram you can manage a single business account from multiple devices, whereas with Snapchat that’s not exactly an easy thing – your account is tied to your personal device, making Snapchat a very individual user driven platform. Of course, you can get around that with external apps for the desktop like Bluestacks or designating a single mobile device you keep in the office that is used for things like this. Nonetheless, one thing that Snapchat stories has in its favor over Instagram stories – anyone can put live URL’s into their snaps and stories. Whereas Instagram your account needs to go through a verification process first in order to do that. So set up a business account and begin taking snaps and adding to your story each day, introducing your team, showcasing the office in an informal way. Show off the fun things and try to drive clicks. Your going to have build up a following for users to see your story so cross promote using your other channels like Facebook and Twitter which may be more optimized at this point. And once you get a real good feel for how to interact with candidates in Snapchat maybe even use it during the screening process – for example in addition to having a candidate send their resume, have them send snaps selling themselves and have them get creative with it.